May is officially designated as Water Awareness Month to highlight the importance of California's water resources to the human health, economic vitality and environmental quality of our state. Water conservation education is especially important with California's fluctuating water conditions and increasing water supply needs statewide. 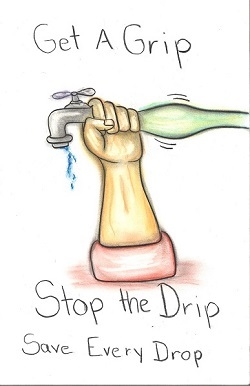 Each spring all students in Yolo County are encouraged to participate in a Student Art Contest illustrating a water awareness theme. The contest helps teachers educate students about the need to use water carefully and its importance in our every day life. The Water Awareness Committee of Yolo County receives hundreds of original artwork entries for judging each year. The winning contestants receive individual prizes, as well as special recognition of their artwork displayed on the annual Yolo County Water Awareness Calendar. For over 15 years, the calendar has been completely dependent on contributions from local sponsors and is distributed throughout Yolo County to 3,000 students, teachers, businesses, local agencies and others. The student art contest will not be held in 2019. Please check back in February/March 2020 for future contest activities. The 2019 calendar will be available at the following locations in January 2019 featuring the 2018 contest winners. Please contact the WRA office (530) 666-2733 if you would like a calendar. 2018 Art Contest Winners List - The 2018 contest winners were acknowledged for their artistic talents with prizes and an award ceremony on May 22, 2018 at 9 am during a Yolo County Board of Supervisors' meeting at 625 Court Street, 2nd Floor chambers, Woodland. Thank you to Blue Wing Gallery for donating the $100 cash Grand Prize. Contest winners received ribbons, certificates and a gift card as prizes for their winning entry.